Red Clover is a wild herb found in the meadows of Europe and Asia which cattle commonly graze upon. The small purple flowers are usually dried before they are used medicinally, either topically or as a tea. According to the University of Maryland Medical Center, red clover is nutrient-rich and contains phosphorus, calcium, magnesium, niacin, potassium,chromium, thiamine and vitamin C. Before taking any herb you should first speak to your physician. Traditionally, red clover has been used as an herbal treatment for cancer. Herbalist Micheal Tierra describes it as a alterative, antispasmodic, antitumor and expectorant. Tierra also suggests its use as a tea in combination with other herbs may help reduce tumors. In Traditional Chinese Medicine, or TCM, red clover is commonly used to treat breast and prostate cancer. The Swedish Medical Center notes that few studies have been done to verify the relationship between red clover and anticancer benefits, and that further research is needed . Red clover contains isoflavones which are believed to act like estrogen, and has been used by herbalists to help ease menopausal symptoms. A study published in the July, 2002 issue of "Maturitas" confirmed the use of red clover as effective in reducing the hot flash symptoms associated with menopause. According to the University of Maryland Medical Center, studies show that using red clover extract can reduce bone loss in pre and perimenopausal women, and increase bone mineral density. 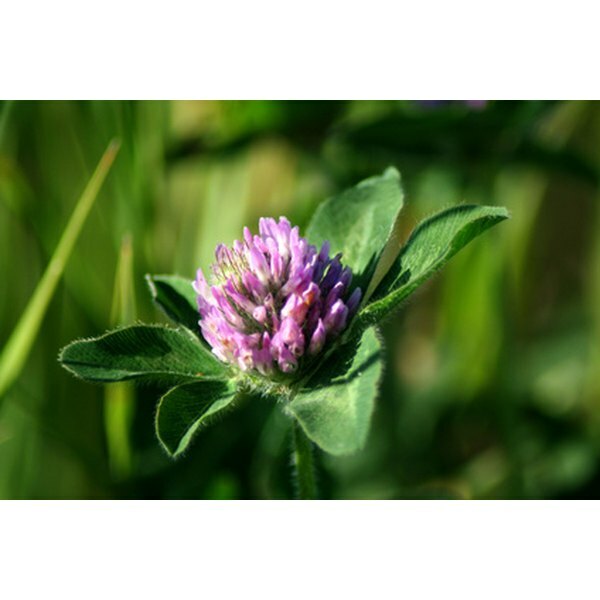 Red clover has been traditionally used in folk medicine to treat inflammation of the skin, whooping cough and respiratory conditions. Herbalists suggest drinking a tea made with red clover, steeped for five to 10 minutes to ease coughing due to colds or the flu. A poultice made from a strong red clover tea can be placed on skin irritations associated with eczema or psoriasis to ease discomfort and speed healing. Red clover contains coumins, which have a mild blood thinning property and are believed to help chronic degenerative disorders. There are no serous effects listed for taking red clover, but it is advised that you speak to your physician before taking this herb. Children and women with a history of breast cancer should not use red clover.